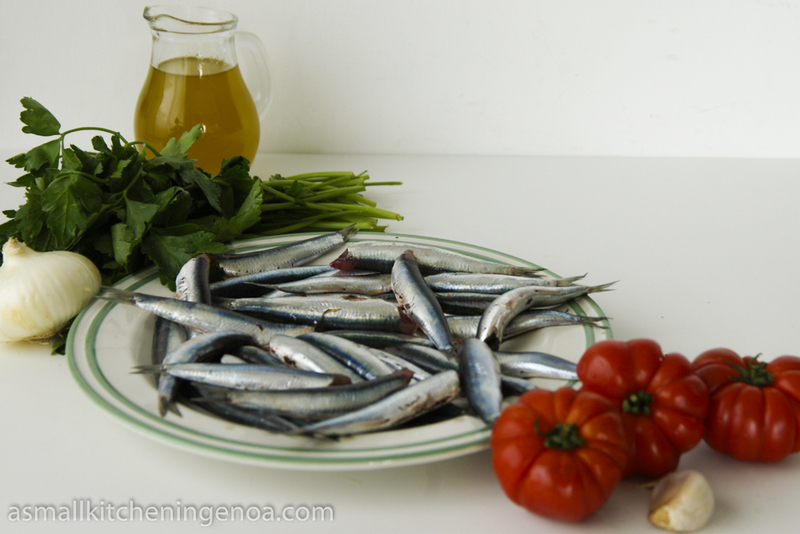 The sparkling skin of the anchovies, the intense smell of fresh tomatoes and basil, the bright green and red colors: all this let me foretaste a dinner outside in a light summer night. The bagnun is a poor dish, the fishermen of the Easter coast of Liguria prepared it on board or ashore once back from fishing. It is quickly ready, few ingredients and a fire suffice. I can imagine a fisherman who cooks the bagnun for all his mates ashore between the boats while the others bent repair the nets. He uses part of the catch, the poorest and more abundant, the anchovies, some tomatoes picked in someone’s garden and some of that hard and dry bread which never goes waste and fills so well the stomach when generously dunk —the so called “sailors’ crackers” . Today very little remains of fishermen cooking their meal ashore. But the taste and aromas of what they cooked still remain instead well alive in the memoirs of our elderly and in our traditional cooking books. These simple favors which accompanied our maritime history are celebrated each year in Riva Trigoso, a small fishermen village near Sestri Levante, where since 1960 each third week-end of July the Bagnun Festival takes place . You will find there smiling old men — wearing blue and white stripy t-shirts and the typical Ligurian blue fishermen berets with a red pom-pom — helping generous free bowls of bagnun freshly cooked in food stands set up along the promenade. You have to que a bit but it is worthwhile! If instead you cannot wait and wish to prepare it at home maybe in a clear summer evening – remember that it is so easy that fishermen cooked it on their boats – you will find here below the traditional recipe. I did not have the “sailors’ crackers” – sadly so difficult to buy in town – so I used the classic toasted slices of rustic bread which are always great to mop up the gravy! 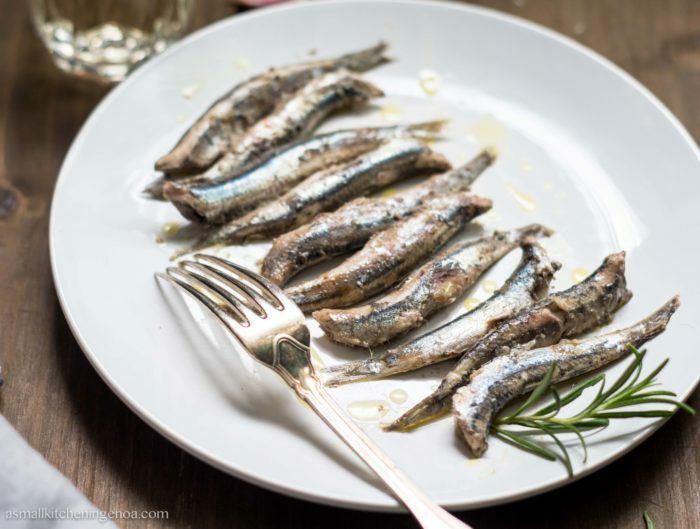 Clean the anchovies, remove head fishbone and entrails (or better: ask your fish seller to do it for your, he will take 30 seconds vs your 30 minutes). Finely chop the parsley with the onion. 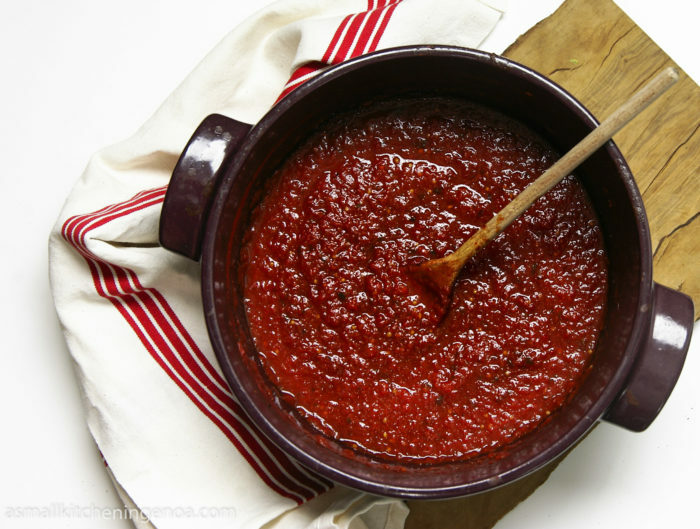 Peel the tomatoes (make a crosswise incision at the base of the tomato and dunk it in boiling water for 1 minute: the peel with go away immediately without efforts) . If you have few time use the tinned peel tomatoes. Finely chop or quickly blend them. Gently squash the garlic clove with the palm of your hand without broke it. So doing the garlic will release its aroma without melting in the sauce while cooking and you can remove it before serving. Pour 3 tablespoons of extra-virgin olive oil in a large pan (better if in a terracotta pan), then add the chopped parsley and onion and shallow fry for 3.4 minutes. When the garlic gets gold (it must not burn) pour the white wine and let it evaporate. Add the chopped tomatoes, then add two cups of hot water (the water used to peel the tomatoes is fine) and the leaves of basil. Season with salt and chili pepper to taste. 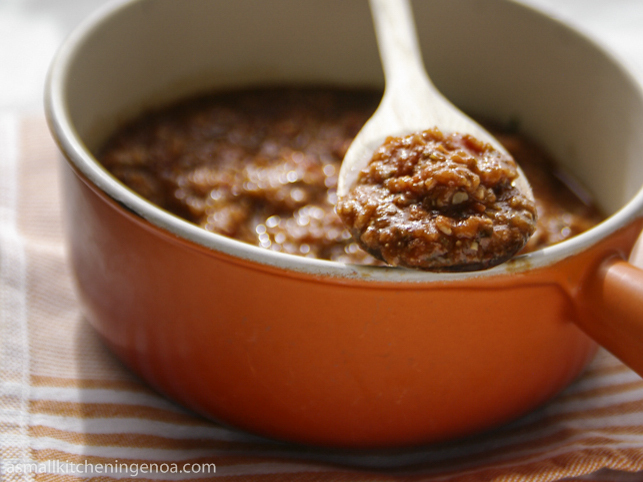 Cook over for about 10 minutes mixing from time to time until you have a thick and flavorful sauce . Soak te anchovies one by one in the sauce and go ahead cooking for other 5 minutes, being very careful not to mix the sauce otherwise the anchovies will break apart. The bagnun is ready! Before serving remember to put a sailor’s craker or a slice of toasted bread in the plate to mop up the gravy! If you wish you can add extra flavor by rubbing the bread with some fresh garlic. 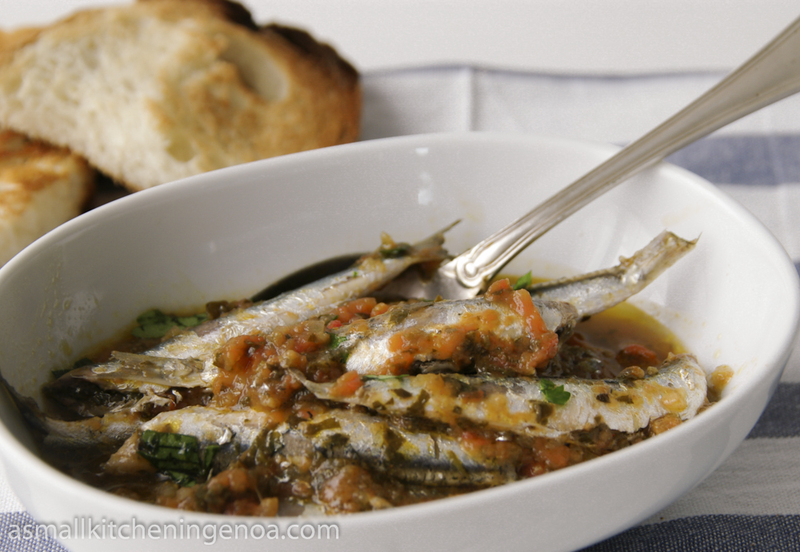 Anchovies cacciatore, a surprising nonsense.